I first came across Provenance Boutique Wines in 2007. This small, Edinburgh-based company owned by Bordeaux-born Valerie Blanc, deals exclusively in Appellation Contrôlée wines from classic French regions. Valerie’s Unique Selling Point was that her carefully selected range of Bordeaux, Bergerac and Loire wines come not only in bottle, but in ‘bag-in-box’ format too. In the year that has passed since I first wrote about Valerie, the world of wine has changed in ways that are significance to her business. Not only is there increasing interest in independent wine producers – and the merchants who go the extra mile to find and import their wines – but the environmental issues around ‘food miles’ and the carbon footprint left by the shipping of wines has become a topic of intense debate. Bag-in-box is a prime example of good environmental practice in packaging and distributing wines. The five-litre boxes sold by Valerie are the equivalent of over six and a half bottles. Yet a box has a smaller footprint, and weighs around the same as just four bottles – meaning around 60% more wine can be shipped for the same carbon “cost”. Valerie also points out that it is easier to recycle bag-in-box packaging than green glass. In fact, there is something of a global wine bottle crisis at the moment, with glass shortages threatening production in some areas, and producers actively seeking alternatives to the glass bottle. Of course Valerie also points out that her wines – made according to strict Appellation Contrôlée standards, including maturation in barrel – are exactly the same as her producers’ bottled products, but with the notable advantage that they will remain fresh for four to five weeks because the bag-in-box is effectively a vacuum pack. Valerie recently called round with a selection of wines, both in bag-in-box and from her bottled range. The bag-in-box wines are very acceptable, easy-drinking and delicious wines, though the Château St Jacques Calon, which I made ‘Wine of the Week’ a couple of weeks ago, shows the fine quality of which this format is capable. This format is still one that many wine lovers cannot reconcile with ‘fine wines’, but Valerie is intent on changing that. This appellation Bordeaux Superieur wine is predominantly Merlot, and pours a deep crimson/black. The nose has a real intensity of cassis and black cherry fruit, with a nicely smoky and spicy edge, and a sense of lithe, supple richness. On the palate there is a nicely crisp edge to this wine, with the savoury black fruit matched by fresh cherry-skin acidity, and a lean, racy tannic character keeping the picture sharp. This is lovely summer in the garden sipping stuff with that cool, crisp character, with just some spice and bite in the finish. £42.00 for a five-litre bag-in-box, Provenance Boutique Wines. Awarded “Wine of the Week”, this is a combination of 85% Merlot, 10% Cabernet Sauvignon and 5% Cabernet Franc. Very dark, crimson/black colour, with an equally dark, velvety nose of cassis and black plum, with hints of chocolate and clove spice. On the palate there’s a freshness about this wine, with acidity and tannins providing a bright, crisp background, and the cool, essence of blackcurrant fruit running through the mid-palate. On the finish, there is plenty of spice and a touch of smoky warmth and breadth, in a very stylish Bordeaux that works out at around £6.60 per bottle equivalent. 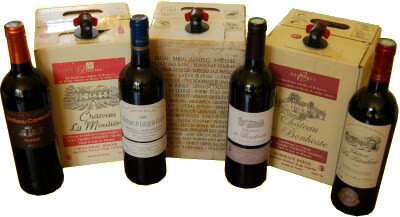 £44.00 for a five-litre bag-in-box, Provenance Boutique Wines. There’s a whiff of sulphur on first opening the bottle here, which soon blows off to reveal gently earthy, bramble and blackcurrant fruit, and a touch of briar. Composed of 70% Merlot, 20% Cabernet Sauvignon and 10% Cabernet Franc, there is nice balance in the mouth, the fruit here seems slightly dilute, with enough sweet-edged blackcurrant coming through, but an overall style that is quite lean and light. On the other hand, this does give the wine freshness and a certain energy, and as some spice and toast builds with the tannins in the finish, the wine improves and becomes a decent mouthful. £7.99, Provenance Boutique Wines. There’s chic, contemporary and very effective new labelling for Canevault’s 2005 vintage Fronsac, a classically composed wine that blends 80% Merlot with 10% each of Cabernet Franc and Cabernet Sauvignon. A vibrant, dark crimson colour, the nose offers an nicely dense, powerful melange of meat-stock, robust black fruit and a certain vegetal character that is full of interest. On the palate this has really good energy and life about it, with plenty of savoury, mouth-filling fruit that is edged by bittersweet, fine and liquoricy tannins and keen-edged acidity. Long and fresh on the finish, this is really well-made and delicious Bordeaux. £10.99, Provenance Boutique Wines. This wine pours a dark crimson colour with ruby on the rim. It has an immediately appealing nose, with cedar, woodsmoke and ripe berry fruit, even a hint of mint in the mix. On the palate this is lovely claret, with a real juiciness to the fruit, of ripe blackcurrant and a touch of black plum flesh. The structure of this wine is excellent too, with spicy, lithe tannins adding a supple grip and good acidity adding to the inherent freshness of the fruit to give a lively, expressive energy in the mouth. Very good. £13.99, Provenance Boutique Wines. Made from 85% Merlot, 10% Cabernet Sauvignon and 5% Cabernet Franc in very limited quantities, the prestige cuvée from this excellent producer takes full advantage of the excellent 2005 vintage conditions, with a nose that exudes Bordeaux aromas of pencil-shavings, ripe blackcurrant fruit and little earth and herbal nuances in a seductive aromatic profile. On the palate that full, sweet, deep black fruit powers through, with a svelte supporting depth of chocolate and charry oak, and wonderfully ripe, peppery tannins that are smooth and supple. The balance is immaculate too, in a really fine wine from this Appellation. This is smooth and rich enough to enjoy now, but will repay cellaring. £15.99, Provenance Boutique Wines.